14-Jul-2015 -- This is the 7th out of 17 reports of confluence visits while cycling from Kashgar (喀什) to Xī'ān (西安). I cycled through the Chinese provinces of Xīnjiāng, Qīnghǎi, Gānsù, and Shǎnxī, 3600 km in 25 days. The story starts from 39°N 76°E. The previous report is 38°N 92°E. The confluence is located 6 km from a road. It was early afternoon – the hottest time of the day – when I reached the vicinity of the confluence. Nevertheless, I decided to make an attempt. I found a track that could take me up to a distance of 5 km, but no further. Due the heat, I didn’t dare to run to the confluence. This time I set off with a backpack containing water and food, intending to walk to the confluence within one hour. For the first kilometre the ground was sandy, but then I crossed a salt lake. The ground got softer and soon I wasn’t sure whether it was still safe to keep on walking forward. What would happen if I would suddenly sink in deeply? The underground was wet such that my shoes got a salt crust. I progressed slowly and cautiously until the situation improved. At the distance of 1 kilometre to the confluence, I surprisingly crossed an unsealed road. I could have taken a much easier approach, but now it was too late already, I had to return to my bicycle anyways. At the confluence point, the ground consisted of salt plates mixed with sand. 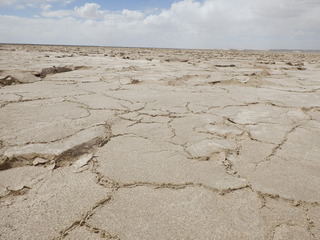 After a rain, the confluence would also be in a salt lake. There was not a single plant, not a single hill, just barren salty ground. After the visit, I walked back to my bike and kept on cycling eastwards. At midnight, I reached Sobei where I could stay in a simple guesthouse. Surprisingly I met the other cyclists there. This day will stay in my memory quite well: I had cycled 245 km and walked 25 km through the desert, including 2 successful confluence visits. The story continues at 37°N 98°E.